For all property types, the sales-to-active listings ratio for last month was 10.2%. By property type, the ratio was 6.8% for detached homes, 11.9% for townhomes, and 13.6% for condos. Generally, analysts say that downward pressure on home prices occurs when the ratio dips below the 12% mark for a sustained period, while home prices often experience upward pressure when it surpasses 20% over several months. BUYERS’ BEST BETS – Top Buyers’ Markets last month were detached houses in Richmond, Vancouver Westside and West Vancouver. SELLERS’ BEST BETS – Top Sellers’ Markets last month were condos/townhomes in Maple Ridge, Port Moody and New Westminister. 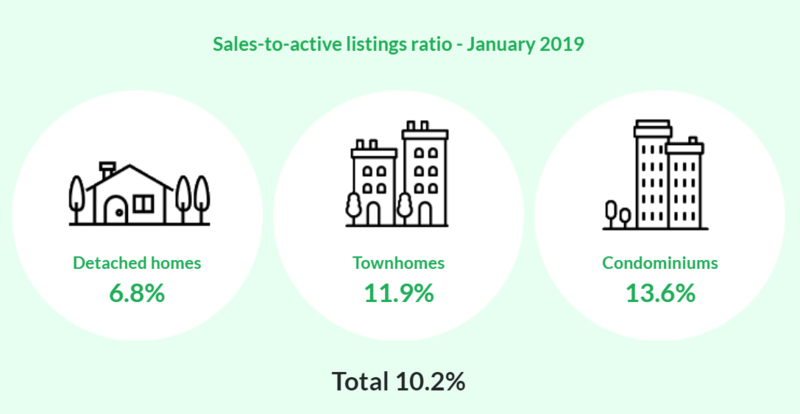 Feb 4, 2019 – VANCOUVER, BC – Home listings continue to increase across all housing categories in the Metro Vancouver housing market while home buyer activity remains below historical averages. Home prices have edged down across all home types in the region over the last seven months,” Moore said.